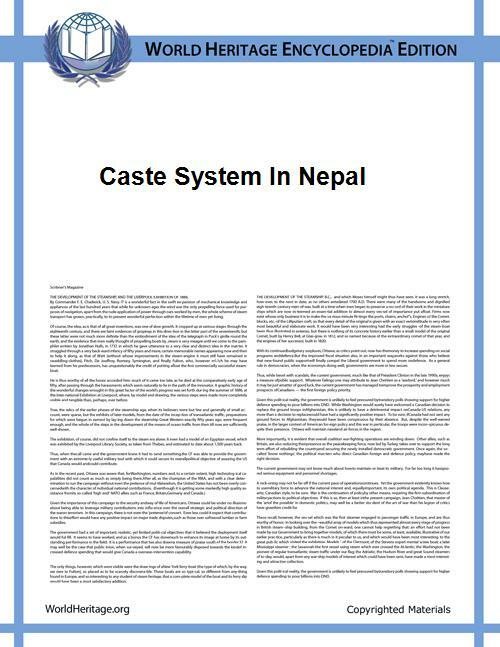 The Nepalese caste system the traditional system of social stratification of Nepal. The caste system defines social classes by a number of hierarchical endogamous groups often termed as Jāt. This custom was previously only prevalent in the societies of the Khas, Newār, Madhesi. Since the unification of Nepal in the 18th century, Nepal's various indigenous tribes have been incorporated within the caste hierarchy. Nepalese caste system broadly borrows the classical Chaturvarnashram model consisting of four broad social classes or varna: Brahmin, Kshatriya, Vaishya and Sudra. The ethnic indigenous groups do not belong to this caste system. The social structure of caste-origin Hill Hindu or Khas groups is simple, reflecting only three groups in hierarchy and there is no four Varna within this category. The mother tongue of these groups is Nepali. The CBS, 2001 recorded only 9 groups in the caste-origin Hill Hindu groups. The social structure of the caste-origin Tarai Hindu groups is complex, reflecting four Varna groups with distinct hierarchical structure within them. 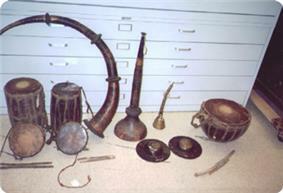 These various cultural groups belong to four distinct language groups: Maithili, Bajika, Bhojpuri, and Awadhi. The CBS, 2001 recorded 43 caste-origin Hindu groups in the Tarai. The case of Newār is exceptional. This group not only presents the complicated social structure among all groups in Nepal, truly reflecting the model of four Hindu Varna categories and is clearly divided into two distinct religious groups: the Hindu and the Buddhist. Newars are divided internally into distinct cultural groups of over 25 occupational caste categories, though they share a common language (mother-tongue) Nepal Bhasa. The Nepali civil code Muluki Ain was commissioned by Jung Bahadur Rana after his European tour and enacted in 1854. It was rooted in traditional Hindu Law and codified social practices for several centuries in Nepal. The law also comprised Prāyaścitta (avoidance and removal of sin) and Ācāra (the customary law of different castes and communities). "Tagadhari" (Wearers of the Holy Thread) Khas - Brahmin, Thakuri, Chhetri; Newar - Brahman and Chhathariya Srēṣṭhas; Terai - Brahmin and Kshatriya castes. "Namasinya Matwali" (Non-enslavable Alcohol Drinkers) non thread-wearing Shrestha and various Newar castes, and 'Gurkha' tribes - Magar, Gurung, Rai, Sunuwar, Limbu, Bhujel. "Masinya Matwali" (Enslavable Alcohol Drinkers) Tamang, Chepang, Kumal, Sherpa, Thakali, Tharu, Gharti, etc. "Pani Na Chalne" (Impure but touchable) Newar lower occupational castes - Bha, Sayami, Kapali, Khadgi, etc. Muslims and Europeans. "Untouchable" Khas occupational castes - Kami, Sarki, Damai, Badi, Gaine, etc. Terai occupational castes - Dhobi, Halkhor, Chamar, Dushad, Dom, Musahars, etc. Newar lowest occupational castes - Kulu, Pode, Chyama:khala, etc. The social values preached by the Muluki Ain, however, were providing restrictive, anachronic and out of step with the spirit of times. These values were seen as a potent instrument of Rana political repression. After the Rana regime, caste rules relating to food, drink and intercaste marriage were openly louted but the Muluki Ain had not been abrogated. In 1963, Legal Code was replaced by New 1964 Legal Code. The legal recognition to caste and all the discriminatory laws made on the grounds of caste were ceased. Brahman is a colloquial Khas language Brahmin caste, who are traditionally priests, educators, scholars and preachers of Hinduism. By tradition and by civil law until 1962— they represented the highest of the four Hindu varna or castes. This 1st varna includes Maithil Brahmin, Khas Brahmins or 'Bahuns' and Rajopadhyaya or 'Dhyo Brahman' people forming the Brahmin varna of the Hindu varna system वर्णराश्रम पद्धति, consisting of people who were traditionally Vedic priests, scholars and educators. The Brahmin castes may be broadly divided into two regional groups: Pancha-Gauda Brahmins and Pancha-Dravida Brahmins as per the shloka, however this shloka is from Rajatarangini of Kalhana which was composed only in 11th CE and many communities find their traces from sages mentioned in much older Vedas and puranas. L ल- Lamsal(लम्साल), Lohani (लोहनी), Lamichhane(लामिछाने), Luitel. Very often, Khas Bahuns can be identified by their middle names being Dev (देव), Nath (नाथ), Mani (मणि), Raj (राज), Prasad (प्रसाद), Devi (देवी). They never use bahadur (बहादुर) as their middle names because it is associated mainly with Chhetris (Kshatriya) and "martial tribes". Khas-Chhetri people, traditional soldiers, administrators and farmers are considered as Kshatriyas of Khas community. 'Chathariya Shrēṣṭha' are the descendants of Malla rulers, their nobles and courtier clans and are considered as Kshatriyas of Newar community. Rajput, Kayastha, Rajbhat castes are considered as Kshatriyas of Madhesi community. The 3rd varna includes people from the Vaishya varna, mainly merchants, farmers, cattle-herders and artisans. Khas ethnicity does not have Vaishya castes. Terai community's various Vaishya castes include hereditary castes including, Koeri, Teli, Bania, Sudhi, Halwai, Marwadi, Yadav,etc. The 4th varna includes people from the Sudradamai varna, mainly laborers, artisans and service providers. The caste engaged in sewing clothing is called Suchikar (सुचिकार)or Sujikar (सुजिकार). Those who play musical instruments like damau (damaha, दमाहा), hudko, and devbaja – particularly in wedding processions—are referred to as damai (दमाइ), dholi ढोली, hudke (हुड्के), nagarchi (नगर्ची) and nagdi. Originally they were called different names according to which instruments they played. Someone employed in sewing is now called darji (दर्जी), tailor, master, or tailor-master. Darji was once used only for tailors, but now it is used for all tailors as well as musicians. Similarly, damai or damahi has also undergone extension of its meaning. Initially it only meant someone who played the damaha. Now it is used for the entire caste. Surnames Pariyar, Nepali, Darji, "viswakarma" and others have come in vogue recently. The caste system is still intact today but the rules are not as rigid as they were in the past. In 1962, a law was passed making it illegal to discriminate against other castes led all castes to be equally treated by the law. Education is free and open to all castes. The caste system conjoints a structural class divide which persists, in which lower castes/ethnicities are generally socio-economically are not equal like those of higher castes/ethnicities. Recent research has also shown that when it comes to Nepali people's impressions of social change, "Poverty, Human Resources and Region" explain more of the variation than "Ethnicity, Caste or Religious belonging" - i.e. people's perception of their own social situation has more to do with geography and objective social class, than with their association with the groups that the state has based its internal social policy on. Participation of Khas-Brahmins in Civil Service is 41.3% in spite of its population size of less than 13%. The population of Newar is around 5%, but its occupancy in Civil Service is more than one-thirds (33.2%), the population of Khas Chhetris constitutes 17.6% but its participation is mere 14.7%. If the major three castes (Khas Brahmin & Chhetris, and Newars) combine together their shares in the Government of Nepal Civil Service Employment is 89.2% in 1991. Their dominance is reflected in education, administration and economical activities of the nation. Among those 73.8% in higher education belong to higher castes, 22.0% Janajatis and 2.9% Dalit. The Khas Brahmins and Chhetris have become major decision makers in the bureaucracy of Nepal has become crystal clear. In terms of earning/income generation, Newar has the highest per capita income of Rs. 38,193. The Hill 'high' castes come next with an average income of Rs. 24,399, Janajatis ranks third with an average income of Rs. 15,630, Dalit Rs. 12,114 and Muslim ranks the lowest, Rs.11,014'  Need of Social Integration The democratic transitions also failed to be inclusive management and functioning governance mainly because government was unable to understand and articulate the spirit of all Nepalese people irrespective of their caste, gender, ethnicity, religion etc. In recent times, following the overthrow of the Nepali monarchy and move towards a federal republic, ethnicity and caste have taken center stage - the indigenous peoples (Adivasi Janajati) who make up a third of the country having been guaranteed rights that have not yet been fulfilled. There is an observable reaction to this among certain Khas Brahmin & Chhetri groups, seeking to prevent group-based rights from becoming an important factor in the country that earlier had a political system associated with group-based discrimination. Certain outside analysts have suggested that "seeking a balance in approach requires addressing both specific indigenous historical injustices while creating a common citizenship for all marginalised citizens regardless of identity, which remains a particularly challenging issue for Nepal." ^ a b c MOPE (2002). Nepal Population Report, 2002. Kathmandu: Ministry of Population and Environment, HMG, Nepal.